In addition to being known from multiple complete skeletons, soft tissue remains including skin, feathers, muscle tissue, and organs have been found for moa. Because of this, the life appearances and anatomy of most species is relatively well-known with abundant genetic material. 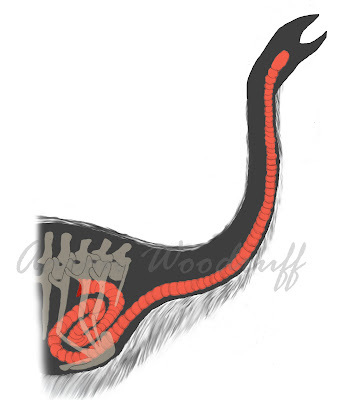 Moa were comparable in in some aspects to modern flightless ratites: all share, for example, a small head mounted on a long neck which is in turn connected to a rigid torso, long legs, with a covering of long strands of fur-like feathers on their bodies. 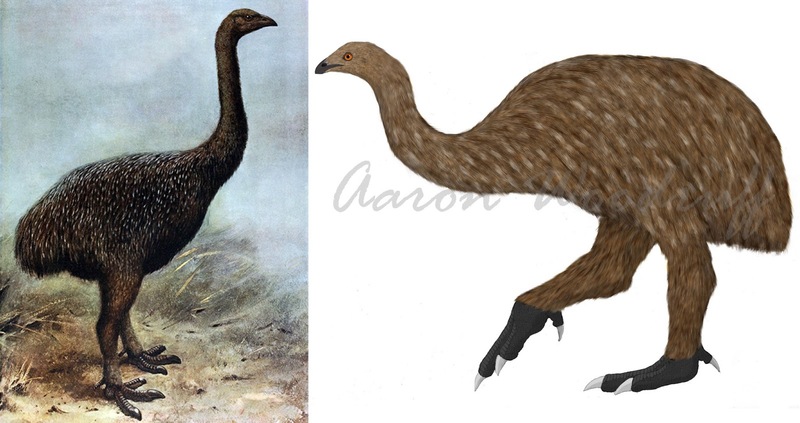 In many aspects, however, moa were quite unique with a number of characteristics not seen in their modern relatives. This blog post will highlight these characteristics. North Island Giant Moa (Dinornis novaezealandiae). Photo taken in 1870. Wiki. Moa beaks and skulls are larger and broader than those of modern ratites, able to deal with a wider variety of plant matter (this will be addressed in greater detail in part 3 of this series). The orbits were large and the nostrils were located at the base of the beak. moa had exceptionally well-developed sense of smell as indicated by enlarged olfactory lobes, a feature which they share with kiwis. An enhanced ability to process odors suggest that chemical communication and other was an important aspect of moa behavior: note the prominent olfactory nerve (labeled CN1) in CT image of the moa brain in the video below which was generated by WitmerLab. For as long as moa have been known to science, most skeletal mounts and early artistic portrayals have depicted them with an Ostrich-like posture: the neck being held vertically so that the head was held high above the rest of the body. However, recent examinations of moa vertebral and cranial anatomy indicate that these birds would have carried their heads in a lowered position when at rest: the neck was normally held in a curved position so that the head was level to the back. Modern kiwis and cassowaries adopt a similar position, which is more efficient for traveling through dense forest vegetation. Moa would have only adopted an erect-neck posture when browsing, during threat displays, or when surveying to their surroundings. Moa legs were generally longer and more robust than those of modern ratites with particularly elongated tibiotarsi (in birds, the fusion of the tibia and some of the tarsal bones) and shortened tarsometatarsi (in birds, the fusion of the three main metatarsals and some of the tarsal elements). The feet were also larger and broader with most species having four toes. Small feet and elongated lower limb segments, physical characteristics shared among modern ostriches, rheas, and emus, are associated with cursoriality and maintaining high speeds over long distances. Moa limb proportions, with their shortened distal segments, suggest that they were not built for active running although they could still move reasonably fast when they needed to. However, moa may have been better suited for maneuverability than their more fleet-footed relatives. Modern cursorial ratites, despite their great running speeds, have wide turning circles and their slender limbs make sharp turns relatively difficult: the relatively open environments which these birds tend to inhabit lessens this apparent disadvantage. The sturdier legs and shorter foot bones of moa were potentially more adept at weaving through trees and other obstacles when evading aerial predators like the Haast’s Eagle (Harpagornis moorei). Kiwis have similar limb proportions. Hindlimb skeletons of eight ratite species scaled to the same femur length. tibiotarsus and tarsometatarsus are about the same length. All flightless ratites evolved from volant (flying) ancestors which possessed hypertrophied forelimbs (wings) and a keeled sternum which supported enlarged pectoralis muscles to facilitate powered flight. When transitioning to a more terrestrial, flightless lifestyle, the sternum lost its keel with an accompanying reduction of the pectoral musculature and of the forelimb skeleton to varying degrees. Ostriches and rheas demonstrate the least forelimb reduction among flightless ratites: the reason for this is because these birds utilize their forelimbs during visual displays and to stabilize themselves when running. Kiwis, emus, and cassowaries demonstrate a more extreme form of reduction in which the forelimbs have become so small that they serve no obvious function and are almost never visible from within the plumage. Moa have become the only known birds to completely lack any external forelimb structure due to the absence of the tbx5 gene: the gene responsible for forming the pectoral girdle. As a result, the sole remnant of the forelimb skeleton is a tiny vestige of bone known as the scapulocoracoid (the fusion of the scapula and coracoid bones) which lies against the ribcage and is no larger than a human finger. The internal anatomy of moa is still mostly unknown. However, a few unique specimens of the Eastern Moa (Emeus crassus) and Stout-legged Moa (Euryapteryx curtus) have been found with ossified tracheal rings within their body cavities revealing the form and structure of the windpipe. These two species, and potentially other members of Emeidae, possessed a convoluted windpipe. From the neck, the windpipe passed downwards on the left side of the body before doubling back on itself and then backward into the lungs, almost doubling this organ’s length. Modern birds which have this adaptation (swans, cranes, etc) are known for producing deep, resonant vocalizations: the convoluted nature of the windpipe forming a structure analogous to the tubing of certain types of wind instruments. The Tetrapod Zoology blog discusses this adaptation in greater detail here. We can imply that moa were highly vocal animals that could produce a broad range of situation-specific calls which could be heard over great distances including contact calls, alarm calls, and mating calls. These Sandhill Cranes (video) provide a reasonable analogue for potential moa vocalizations. Moa plumage is particularly well-known thanks to the discovery of numerous desiccated specimens recovered from caves throughout New Zealand. Like modern ratites, moa plumage consisted of long, shaggy, and somewhat hair-like strands for insulation and repelling water. These birds possessed cryptic coloration which was adapted to camouflage them within their respective environments, much like modern kiwis or the Kakapo (Strigops habroptilus), a flightless New Zealand parrot. Base colors ranged from light yellowish-brown to reddish-brown and many feathers were tipped in white, which would have produced a mottled or speckled effect. Such coloration was ideal for concealment and likely evolved as a defensive measure against the keen-eyed flying predators with which these birds coevolved. Moa. Figure 3 from Rawlence et al., 2009. The nine known species of moa ranged in size from the diminutive Bush Moa (Anomalopteryx didiformis) to the large yet lanky South Island Giant Moa (Dinornis robustus); a range of 15 to 250kg. In addition, most species display female-biased sexual dimorphism (also known as "reverse dimorphism"), that is, the females grew noticeably larger than the males. 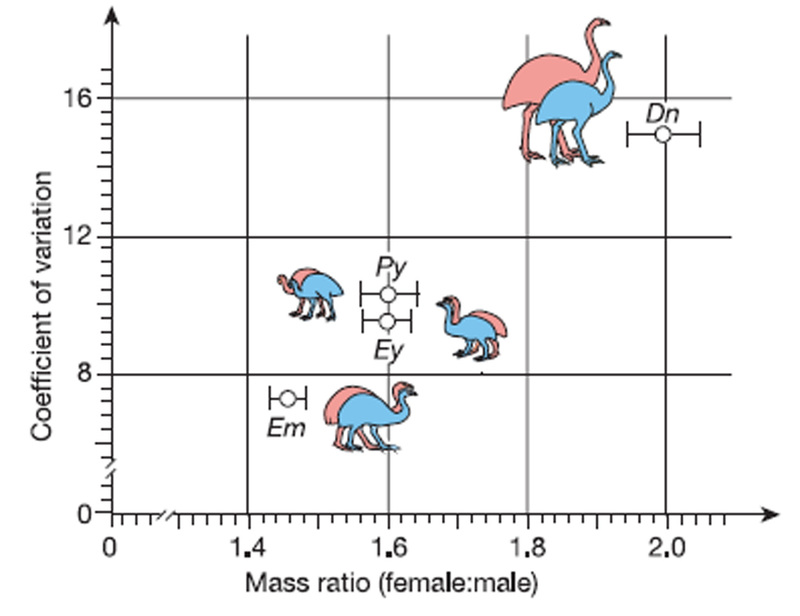 For most moa, females typically ranged from 15 to 20% larger, which is typical of modern dimorphic ratites. 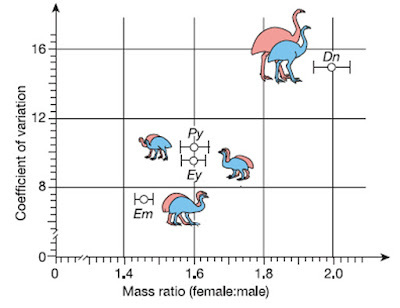 Members of the genus Dinornis, however, display the most extreme dimorphism seen among any terrestrial vertebrate with females growing up to three times the mass of males. 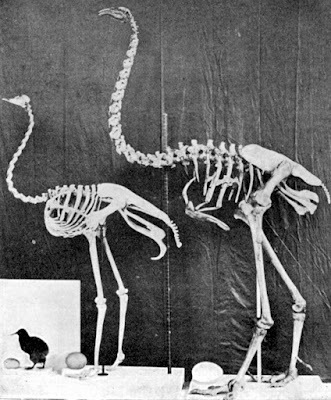 The size difference is so vast, in fact, that the male morph of both Dinornis species was once thought to be a species in its own right: called the Slender Moa (D. struthoides). DNA sequencing in 2003 has since corrected this mistake and several other formerly recognized moa 'species' which had been established based on size differences were also debunked. for the genera Dinornis, Pachyornis, Euryapteryx, and Emeus. Figure 3 in Huyen et al., 2003.